Microsoft Teams is the new communication / collaboration platform in Office 365, and a powerful tool for educators. Microsoft added the OneNote Class Notebook tool to Teams over the summer, and this is now the go-to method for creating your notebooks. You can also create Staff Notebooks for staff teams to share resources, meeting notes and to swap notebook sections with each other. Using Microsoft Forms for flipped learning. Students first watch the video and then answer the questions to learn the content before their lesson. Class time can then be used to discuss the material and apply their knowledge/skills. Microsoft Teams is the new communication / collaboration platform in Office 365, and a powerful tool for educators. Find out how to create a team for your teaching class or department. Assignment tool – create an assignment for your class and use the assignment tool to distribute the task, collect back in again, and mark and provide feedback. Class Notebook creation tool – Create a OneNote notebook specifically to use with your teaching group. This tool creates a “Content Library” section for your own notes, and a section for each of your students. I am presenting today at The City of Leicester Summer Teaching and Learning Conference on Microsoft Office Mix, and how teachers can use it to create flipped learning resources from their existing old powerpoints. An example of how Office Mix can be used to add voice-overs and annotations to existing PowerPoint presentations, and can convert these to video for uploading to somewhere like YouTube or Office 365 Video, to create a flipped learning experience for students. The next meeting is to be held on Thursday 16th June 2pm – 4pm at Lancaster School for Boys, Knighton Lane East, Leicester LE2 6FU. Salamander Soft offers Office 365 /SIMS integration at an affordable price. The pick of the bunch from BETT, their software offers some really useful functionality for those looking to automate user provisioning or to develop a VLE within Office 365. I’m very pleased that they agreed to come along and show us what they can offer – they are a small company and don’t do this sort of thing very often! I have sent an invite to this part of the meeting to the Network Managers group, as I am aware of a lot of interest from them. Don’t be surprised if they want to come along too! Introducing Yammer, and the new Digilit Network group, followed by a brief discussion on effective ways we can use Yammer to communicate. Mahala will be sharing an online version of the Digilit Survey for those who wish to continue using this tool to measure Digital Literacy at your schools. This is a core meeting, and attendance is expected from all Digilit Network Leads. If your Lead cannot personally attend, please ensure that your school sends a representative in their place. A first look at the new sharepoint portal being developed at The City of Leicester College – just the styling for now, not the content or features. The approach has been to follow the brand look-and-feel (from our public website) in terms of colours, characteristics, heading/title typography etc. – but without compromising SharePoint’s functions and features. The design development site’s navigation elements (top bar) are currently dummies apart from ‘TEST PAGE’ and ‘TEST PAGE 2’ that show options for individual page layouts and colour treatments. The ‘Subjects’ link is to show the drop-down menu style. The homepage will carry the required portal ‘widgets’ and links – the full width picture has been added to show the option for full width ‘title’ images. 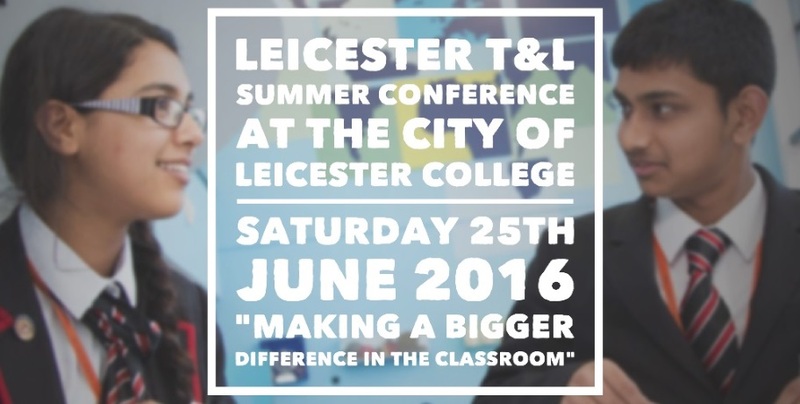 On Saturday 25 June 2016 The City of Leicester College will be hosting the “Leicester Teaching and Learning Summer Conference”. This will be a high-impact training conference for teachers run by teachers who want to make a bigger difference in the classroom. This is a great opportunity for the Digilit Network to share good practice around use of technology in the classroom, and an opportunity to improve Digilit Skills across the city. It would be great to see members of the Digilit Network taking an active lead in delivering workshops throughout the day, and promoting the event with colleagues. Workshops will provide engaging classroom based research and/or practice that will provoke excitement, interest and inspire teachers and which will ultimately impact on the learning and life chances of our young people. Each delegate will be able to attend up to eight 20 minute, or four 40 minutes sessions, or do a mixture of these. The day will include lunch and a key note speaker. The conference is free to anyone who runs a workshop and all TCOLC staff. Delegates will only pay £30 each or £50 for two delegates. City schools will get 2 for the price of one. If you don’t run a workshop, we hope you will all attend (and tell every teacher you ever met ever! ).